The Seville Queen Bedroom Group by Avalon Furniture at Wilcox Furniture in the Corpus Christi, Kingsville, Calallen, Texas area. Product availability may vary. Contact us for the most current availability on this product. Drawer/Shelf Construction Full extension side guides. Case Construction Wood Solids and American Ash Veneers. 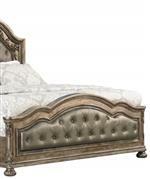 This beautiful collection presents glamorous style for your bedroom or dining room setting. 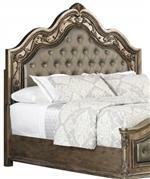 Showcasing exquisite design details, the pieces feature full extension drawer side guides, tufted upholstered headboards and footboards and dining chairs, felt-lined drawers, cedar-lined drawers, bun feet, and other features, these elegant furnishings will transform your bedroom setting for years to come. The Seville collection is a great option if you are looking for Glam furniture in the Corpus Christi, Kingsville, Calallen, Texas area. Browse other items in the Seville collection from Wilcox Furniture in the Corpus Christi, Kingsville, Calallen, Texas area.